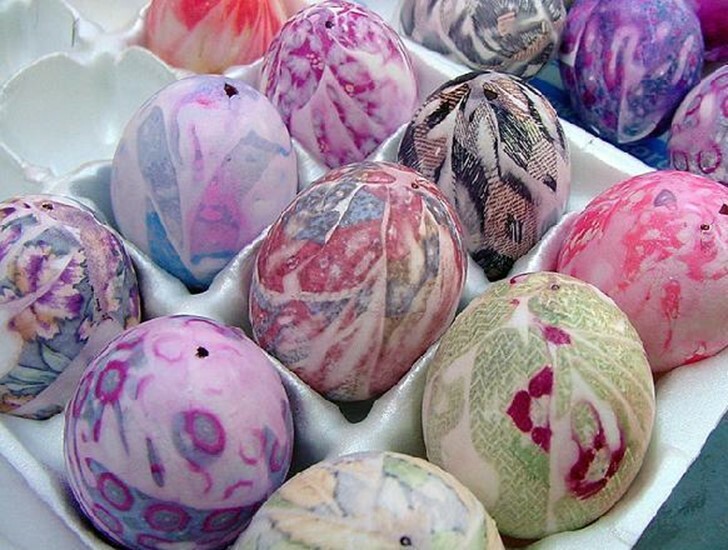 For coloring Easter eggs with silk you may use cloth, but it is even better to use unnecessary silk ties, because they have such crazy, vintage, floral, oriental colors! 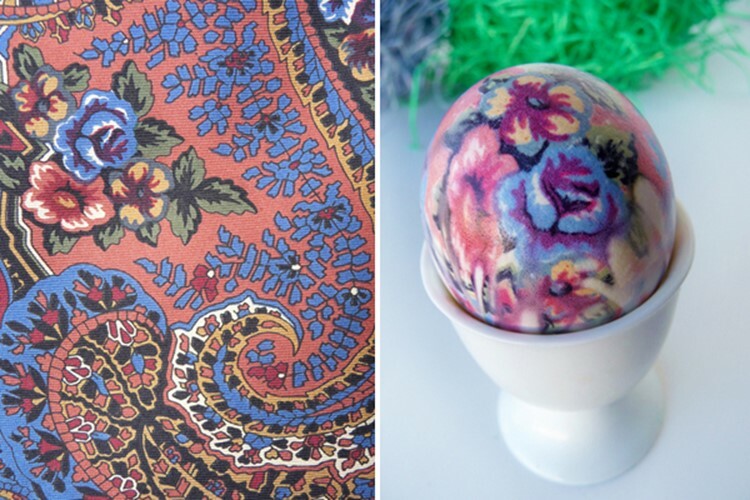 Remember, when it comes to ties, you may not like the horrible tie for your man, but for painting Easter eggs it fit perfectly. Old blouses and scarves may also be suitable. You can experiment with colors, but you never know how many colors will be transmitted with a tie on the shell, the result is always a mystery until the last moment! Once again, the silk should be 100%. This is the main secret of success. So, the first step is cutting all of the seams. 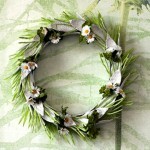 We take out the substrate, cut off the tags, we need only a part of the silk. 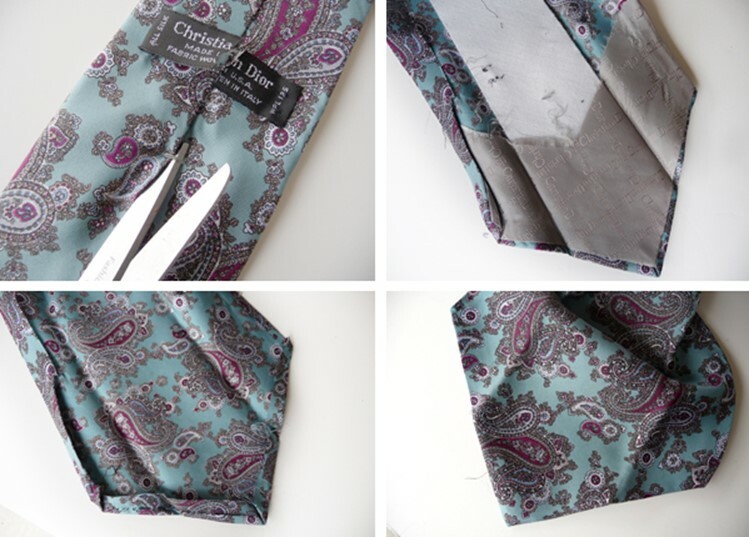 Cut the fabric into pieces, enough to wrap the eggs. 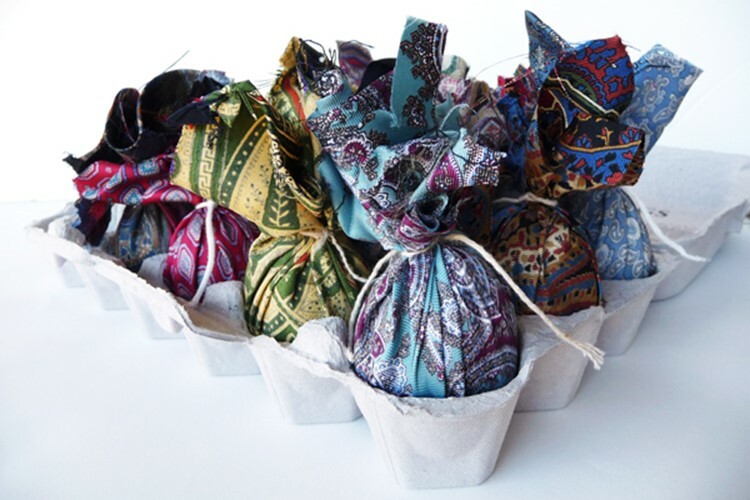 Wrap eggs (colorful silk side inside!) 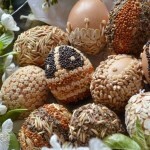 tightly and at the same time carefully, so the eggs are not broken. The better the fabric is in contact with the shell, the better and brighter the image will be transferred. 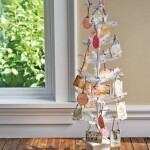 Tie a string or fasten with a rubber band. 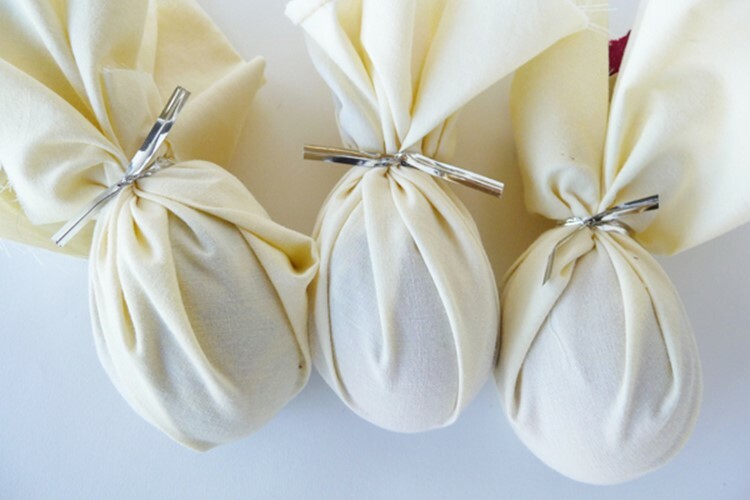 After that, the eggs should wrap again – in a bright and light fabric, cotton. Old pillowcase, sheets, tablecloths are ideal for this. All the eggs we put in an enamel pot and fill with water (it should cover all the eggs). Add a secret ingredient – 3 tablespoons of white vinegar. Place the pot on the stove. After boil reduce the heat and cook the eggs for 20 minutes. 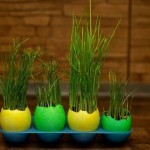 Now you can get the eggs to cool. 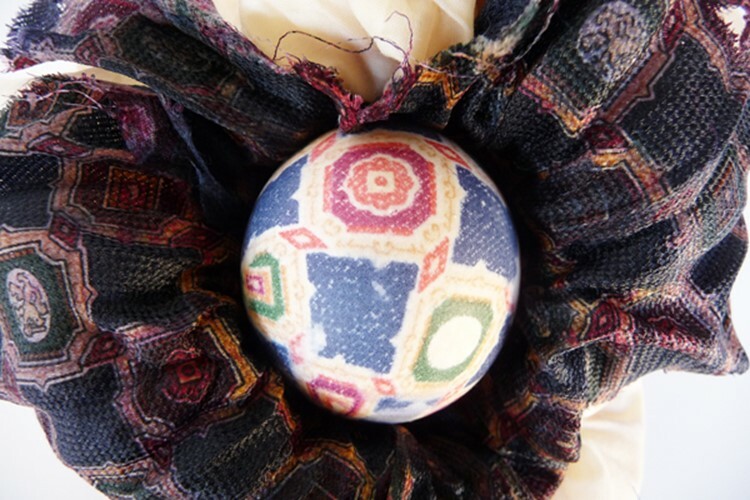 Once the eggs have cooled completely, the fabric can be removed. Done! 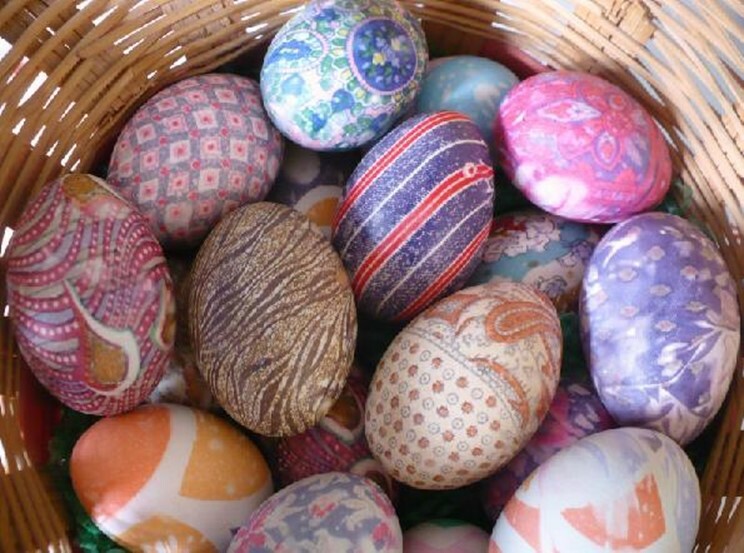 These colorful eggs will make your Easter holidays more joyful and fun! 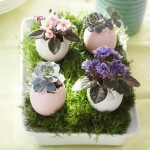 I am sure that you will enjoy these Easter eggs. Happy Easter!